I have this porcelain doll. I am trying to find her maker and value, but I can't seem to find anything out about her. 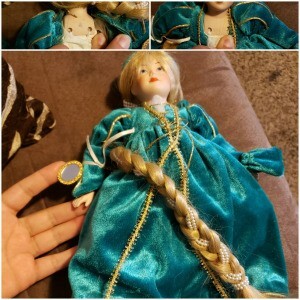 To me it looks like a Rapunzel doll. It was made by the Danbury Mint. 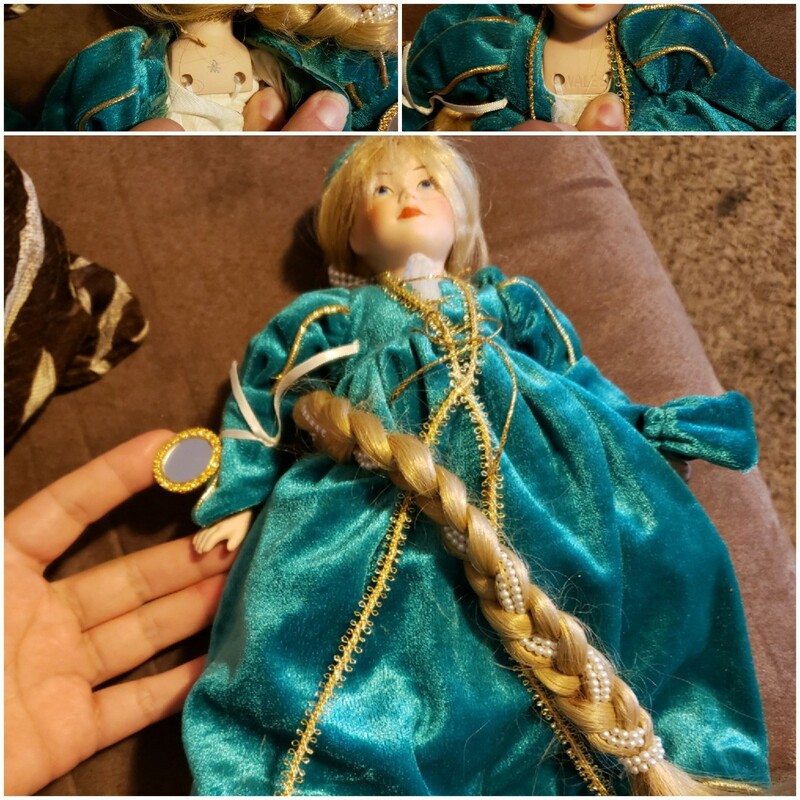 These dolls usually do not sell for what the buyer paid for them. Her face looks like a Danbury Mint (or one of the many knockoffs who looked just like her). The logo fuzzes out on my bad equipment so I can't verify that. There are several sizes of these lovely gals (either DM or the knockoffs. Sadly no matter if she is the tall or small, real DM or a knock off, the answer is still the same. The are all sitting unsold on eBay as low as $1.99 and as high as $60 dollars and have been sitting there for MONTHS on end. So DM made way too many of these dolls and then add to that there were companies who tried to reach poorer buyers that made knock offs. So between the two streams there were millions of real and look alike dolls flooding the market from the 1970s to the 1990s. Fast forward to today and there is that whole thing with the lady that tells people if it doesn't "spark joy" get rid of it, and the market for resale was flooded with dolls (and tons of other stuff) that no one wants. Great for buyers, TERRIBLE for resellers. I find the whole thing quite repulsive because the DM at least (and some of the knockoffs) were quite expensive in the day and many people invested thousands of dollars hoping that their future self would get rich. Now their future self has a bunch of dust collectors and some Netflix woman telling them they are bad people for holding on to them. What is this world coming to? I wish I had better news for you.